Scientists at the University of Warwick have modelled an outbreak of the bee infection American foulbrood in Jersey, using a technique which could be applied to other honeybee diseases such as European foulbrood and the Varroa parasite. As well as modelling how bee infections spread, the method also allows scientists to simulate various disease control interventions in order to measure their efficacy. The researchers used two sets of data gathered two months apart during an outbreak of American foulbrood in Jersey in the summer of 2010. This provided two 'snapshots' of the disease from which they attempted to reconstruct the entire epidemic. Reconstructions like this are common for livestock infections, but this is the first time the method has been applied to bee disease. American foulbrood is caused by the bacterium Paenibacillus larvae, which affects the larval stage of honeybees. It can cause the death of an entire hive within a matter of months. The Jersey data covered 450 honeybee hives, their location and their owners, from which the researchers built a computer simulation which modelled the speed at which the infection grew as well as how it spread geographically. Dr Samik Datta of the WIDER group, based at the School of Life Sciences at the University of Warwick, said: "Honeybees are one of the most important bee species in the world in terms of their contribution to food production through pollination. "But in the past 20 years there has been a marked increase in the level of disease among bee populations. "American foulbrood is an unusually virulent disease which can wipe out a hive within a few months. "By understanding how it is spreads from hive to hive, we then have a good basis to formulate interventions. "This is the first rigorous statistical analysis carried out on a honeybee disease epidemic that we are aware of." The model suggests that just under half of the 2010 Jersey infection spread was attributed to transmission by owners between their own hives. The researchers suggest that distance between colonies was another important factor in the spread of the disease, with the disease mostly spreading between hives less than 2km apart. The model also simulated the impact of different control strategies on controlling the epidemic and found that the measures taken by authorities in Jersey at the time – to inspect and destroy infected colonies – were the most effective. However their model suggested an earlier intervention would have made disease extinction more likely. 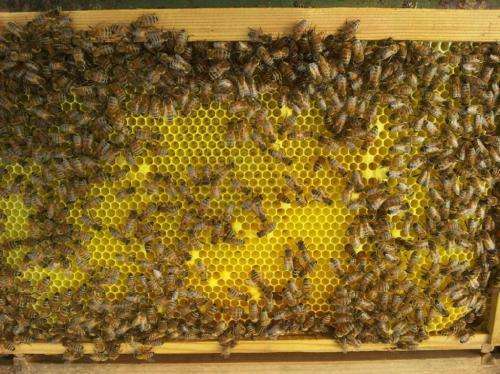 The researchers hope now to expand their model to investigate the spread of European Foulbrood, a more common bee disease in the UK. They also believe the same technique can be applied to the Varroa parasite. Dr Datta said: "Using just two snapshots of data we have been able to reconstruct this epidemic, and we are confident that our technique can be applied to a wide range of other outbreak scenarios."